Hello employers! if you are struggling to make epf payment online. we are here to help you! just read guidelines below and download the pdf file to see instructions with screen also watch the video at the end of story. Step 1: Generating ECR challan from the previous month. (download the file adjust the current details and upload back to epfo). and trrn will generate. Step 2: Once trrn generate the click on payment mode online on EPFo ECR Portal, select bank and complete the payment or visit your bank >> pay epf>> enter >> epf trrn >> make payment. I Know generating ECR challan for the 1st time, makes some headache kindly follow the guide carefully to avoid. verify your company details like pf, code, establishment code etc. Once you logged, click Payment>>ecr upload on the navigation menu. 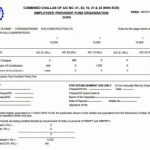 Select “Wage Month”, “Salary Disbursal Date” in the “ECR Upload” Screen. all above details in a single line. Plas,e update with the existing month. Select your ECR file to upload ECR Portal aka UAN employer portal. Enter the rate of contribution 10% or 12%. and click on upload button. after that click on verify. “File Validation Successful” otherwise error message will be shown on the screen. Now the TRRN (Temporary reference number will be generated) for ecr file. Now click on Prepare ECR challan button. the screen will show you summary epfo payment details. Enter the Admin charges for account no 2 & 21, also you may edit contribution 21 account too. After that Click on ECR challan generate Button. On next step, you view the payment amount or edit the challan details. after that, click on finalize. Download acknowledgment from processing challan list. 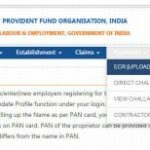 You may see finalized epfo payment challan and its ready for payment. Assuming that you are this location on the uan employer Portal. click on pay button in the To process challans list. Plase, select online mode for epfo payment. and click on the select bank to see available banks with sbi epfo payment gateway. almost all major banks like icici,hdfc, axis, sbi etc listed on the epfo payment portal. Select the bank and click on continue. only by net banking works. after that, you will go the payment gateway interface login to your bank account and complete the payment. You can Pay in 2 steps generating challan and trrn. and visit your bank net banking select payment enter your trrn and click on make payment. another way visit uan portal generates challan, select the bank and click on complete payment. 1.first we have to check the list of the banks and ensure that your bank is listed or Not. 3.At UAn employer Portal, you Must already register with epfo by clicking EPFO Establishment registration. Follow this path Epfindia.com>>> services|>> employers>> TRRN query search. or directly visit this link on uan employer portal. Enter you TRRN and click on search. This the way employer check the last month payment contribution status to epfo. You can Make The Payment online for EPF Through State Bank Of India.The Payment can be Done by State Bank Of India Online site. Make The EPF Online payment through Only corporate or saral follow the Steps in order to make the payment online through SBI. 1.In order to make EPFO payment is to visit the sbi net banking portal. 2.Next, we Have To login the corporate Banking section only by corporate or saral users. retail if its a saving account for the individual. 4.Next, we have to enter valid TRRN, with 12 days only. click on continue to complete the payment. for retail users in cases of the company doesn’t have any current account with SBI. another visit sbi epf directly, select sbi net banking or other net banking and follow the guidelines above or on the screen while payment processing. The last date for epfo payment is 15th of every month. for net banking 12th of every month.